A team of researchers at the University of Tokyo has developed a gravity-defying backpack that enables its wearer to jump much higher and farther than normally—similar, perhaps, to a giant leap on the surface of the moon. The group has named the device Lunavity and has posted a video on YouTube extolling its virtues. 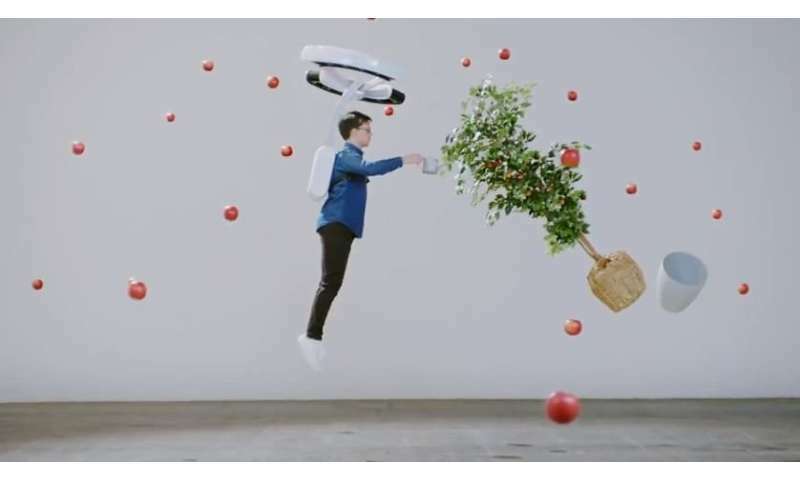 The Lunavity is essentially a harness for connecting a human to a drone and allowing them to become airborne, if only temporarily. Once strapped in, a user would see arcs of rotors above their head. The rotors would presumably be activated just prior to a user's desire to leap up into the air. The initial force would be instigated by leg muscles—the rotors would then keep the user rising for several seconds until reaching a peak, at which point the user would slowly fall back to Earth. The researchers report that the Lunavity should allow a person to jump two or three times higher than normal. They also note that the point of the device is to extend or augment human abilities. Doing so, they add, could make crosswalks or stairs obsolete. It might also offer more freedom to people with disabilities. The team has created a website to support the device, though they have not made their intentions clear. They advertise the fun aspects of the Lunavity and its intuitive control system, and even suggest it could be used to help pedestrians avoid tripping and falling down. While other engineering teams often create websites to market their product, the team at Lunavity has not done so, which makes visitors to the site wonder if it is a serious endeavor. Notably absent in the video is a working prototype of the device. Instead, the researchers use animations to demonstrate its usefulness. That absence suggests that the team has not yet built a prototype safe enough for use by people. Further evidence of the team's inability to build a working model was the non-functioning prototype displayed at this year's ongoing SXSW festival. Nice, so long as you don't think about it's effect on your balance when not jumping. Another student type project that should stay a student project. Looks like science fiction, interesting to see, but not really useful. looks like a 'little' drone....size of da' prez' hands, unable to lift much because the limiting tech is battery energy density and how many coulombs it can store per unit volume and at an acceptable total weight. An American/Chinese scientist had a handle on real antigravity tech while she worked for us at Huntsville Alabama. However, her efforts were not given much credit, perhaps because the oil interests got wind of it and put pressure on her employers to squash her research. To continue her research, she went to China where it appears she got a MUCH more enthusiastic reception from their military. So when laser equipped nuclear powered flying saucers do hits on us from about, say, 50 miles up and start taking apart our cities like a broken clock, then we have only our friendly oil industry to blame.